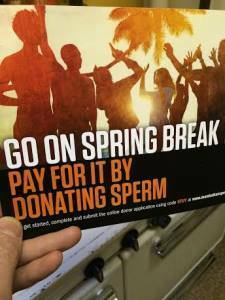 Selling your sperm or eggs means much more than paying for a spring break vacation. This kind of irresponsible advertising (from a NY sperm bank), only goes to show the lack of proper education given to prospective donors about decisions made now for a quick buck, that can affect them (and their families) for the rest of their lives. If you are considering selling your sperm or eggs, are you thinking about your medical history, past, present and future? Would you be willing to provide ongoing current medical information with respect to yourself and your immediate family? As a "donor", it is important to consider the ongoing ramifications for any children conceived who share your DNA. If you sell your sperm this year, the sperm may be sold for many years into the future and potential mothers may keep that sperm for many years after purchase, attempting to provide their children with full biological siblings. Several families on the Donor Sibling Registry (DSR) report that they know of half siblings more than 20 years apart in age. Egg donors who donate to the new egg banks are now facing similar situations. Should you or a member of your immediate biological family develop a health or medical issue following your initial completion of the donor interview, it would be essential that you provide this information to the sperm bank or egg clinic/agency/bank and post the information (anonymously if you'd like) on the DSR website, www.donorsiblingregistry.com, which enables donors, recipients, and offspring to make mutual consent contact, to meet each other, and also to share and update medical/genetic information. Published research has revealed that 97 percent of egg donors and 84 percent of sperm donors have never been contacted to update their medical records, while 31 percent of egg donors and 23 percent of sperm donors report that they, or immediate family members did have medical/genetic issues that would be important to share with families. It's not just your looks, intellect or athletic abilities that might get passed along. Susceptibility to disease is also often inherited. For many years after your original donation, children who share your DNA may develop medical and health concerns that can only be properly addressed with your updated information. Conversely, it might be crucial for you to know about any medical issues reported by families, as you may someday have children of your own. It is also important to note that the accuracy of the medical and health history you provide to the sperm bank or egg clinic/agency/bank is crucial to the potential parents reviewing that information. Certain conditions carry genetic components that are not readily tested for, and your accurate information is vital for proper screenings, testing, and preventative care. Have you considered the possibility that in this small world your children may encounter biological half-siblings? At the present time, sperm banks and clinics do not keep, nor are they required to keep, any record of live births resulting from any specific donor. What this means for the children born with your DNA is that they may be many in numbers. Currently, the largest group of half-siblings on the DSR is around 200. The children you have now, or may have in the future, may meet your biological children born from your donations. Random meetings among half-siblings are regularly reported on the DSR. Honesty is essential. Before you donate, consider your willingness to be forthright with your children. Are you planning on donating anonymously? If you are planning on being an "anonymous donor" it is important to understand that because of advances in DNA testing and Internet search engines, the likelihood of your remaining "anonymous" in the future is growing smaller. Have you considered what your reaction will be if you are "found" by your biological children in the future? The children born from your donations may be curious and will want to search out their ancestry, medical backgrounds and their genetic roots. As noted above, many donors have more than 20, 50 and even more than 200 biological children. Have you considered the possibility that you will be contacted in the future, even if your donation is anonymous? How would you respond if, one day in the future, you were asked to meet with your genetic offspring and his or her parents? You will need to think about the fact that this could be potentially disruptive to any family that you may have formed in the traditional manner. With this in mind, would you consider registering on the DSR so that urgent information can be passed back and forth right from the start?? Please consider how you might feel about your donation in the future. It is likely that more than one child will come to exist as a result of your donations. These children are genetically yours; in fact, they may one day have children of their own who will be your genetic grandchildren! Take a moment to imagine how donor offspring might feel. Many will wonder about where they got some of their physical characteristics. Or wonder about where they get their talents and personality traits from. Many are extremely curious about genetic family history and ancestry. And many feel a deep longing to connect with and to know their unknown genetic parent. Imagine your reaction if your genetic offspring found you and expressed a strong desire to connect, or if they needed a lifesaving bone marrow transplant. Please consider these issues carefully as you make your decision on whether or not to become a donor. Your actions today may have an incalculable effect on the future. Your donation is much more than a transaction with a sperm bank or egg bank/clinic/agency.